Last night, I woke up early because of my jetlag. 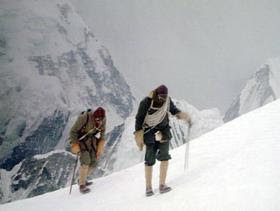 Around 3.15 am it occurred to me (the weirdest thoughts come up at night) that getting started in sales has some similarities with climbing the Mount Everest. A couple of months ago, my good friend Marco Hoogerland (an amazing mental coach for top athletes, including top-notch football players, world and european champions and olympic athletes) hosted an evening event with Robert de Vries. Robert de Vries is a Dutch climber, and one of few men that has endured the severities of reaching the top of Mount Everest, the highest mountain on earth. Robert presented his movie to the in-crowd, accompanied by stories and many questions of the dazzled audience. What an unbelievable performance - I was stunned by his humbling and riveting story. It also occurred to me that you have to be somewhat crazy/selfish to reach the absolute top. Many things have to be left behind (sometimes even relationships with loved ones) to achieve the goals at hand. I am not saying anyone should. It seemed to me that getting started in full-commissioned sales is somewhat like climbing (albeit more comfortable perhaps). You can see the top, but have no idea (yet) how to get there. - Some are already trained when they start, some aren't. Trained (experienced) people may have an advantage to reach the top sooner, but it may also hinder them in a way, because they might think they know it all and get reckless/careless while climbing is dangerous. - You earn your climbing gear (product/job/industry knowledge) along the way, as you proceed through the basecamps. - Some get stuck in snow storms and have to wait a while and watch weather conditions before they can proceed to the next camp. - It is hard work, no matter how experienced you are - you will still have to walk the walk. - It's great at the top, but anything below doesn't satisfy your dreams, so you may have to endure dissatisfaction, or disappointment when things aren't going as smooth as you had hoped for. - Sherpa's (mgmt? finance? administrative colleagues?) can do a lot of the work, but you will still have to climb yourself. - If your goal is to reach the top, you can't stop when others are not making it. Learn from the winners, not the whiners. It is quiet you say? This week and next, my better half Chantal and I will be packing boxes and cleaning out our house before.... we move to NY on the 26th. The website will have a grand change within the next 6 - 10 weeks or so, with added features and a full-fledge professional layout, so it will get better eventually. While we're busy with 'the move', your contributions are much appreciated. Please feel free to forward any articles or thoughts you'd like to share. If you're still shooting to crush your targets, break a new record, or want to set yourself up for a nice Christmas paycheck: it is now or never. Put in all the energy and effort you have - we can all relax once we reach year-end, but it ain't over til the fat lady sings!